Sri Konda Laxman Telangana State Horticultural University HORTICET 2018 Notification/ Horticultural Common Entrance Test 2018, Entrance Test for Diploma Horticulture Students For Admission int B.Sc.(Hons.) 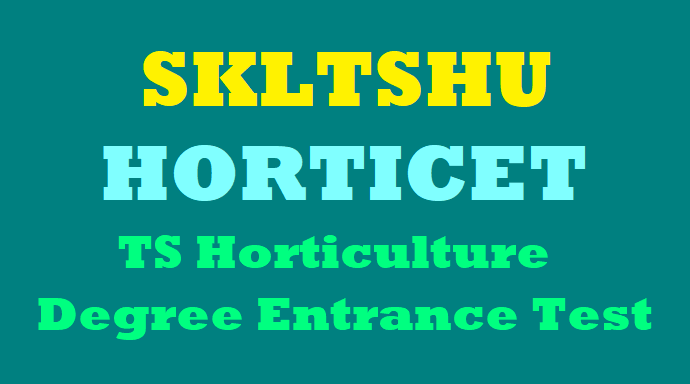 Horticulture Course 2018: #sklts horticultural university has issued the HORTICET 2018 notification and Sri Konda Laxman Telangana State Horticultural University invites the applications from the Diploma holders in Horticulture for admission into four years B.Sc.(Hons.) Horticulture Degree Programme through #HORTICET 2018 for the academic year 2018-2019. BSc Horticulture Degree Admissions..
A pass in Horticulture Diploma Course from SKLTSHU / Dr. YSRHU (Those who are going to complete the diploma requirements in 2018-2019 academic year can also apply). The candidates shall be required to have completed 17 years of age as on 31st December of the year of admission with an upper age limit of 22 years for all the candidates and 25 years in respect of SC, ST and 27 years in respect of PH candidates. Syllabus covered in respective Diploma courses (Diploma in Horticulture). Admissions will be made strictly as per the rule of reservation based on merit through the Entrance Test in Telugu language. The HORTICET 2017 will consist of only Multiple Choice Objective Type Questions in Telugu. The Test will be conducted as per schedule. from Controller of Examinations, SKLTSHU one day before entrance test.